The 8080 is an 8-bit CPU containing 8,000 transistors and capable of addressing a then-impressive 64 KB of memory (it’s predecessor, the 8008, could only address 16 KB). The 8080 used 6 micron traces. The Zilog Z-80, designed by former Intel employees, was essentially an 8080 clone with 80 additional instructions. It came out in July 1976. 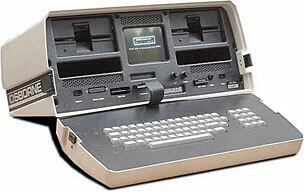 The Z-80 ran at speeds from 2.5-10 MHz. Intel also introduced a slightly improved version of the 8080, the 8085. The standard operating system of the 8080, Z-80, and 8085 was CP/M, although several computers using these chips also had proprietary operating systems, such as Tandy’s TRS-DOS. While 8-bit processors seemed impressive in the late 1970s, by the early 1980s it was becoming evident that their days were numbered as far as personal computers went. Newer CPUs with 16-bit designs were able to address vastly increased amounts of memory, something made necessary by large spreadsheets, large word processing documents, and large databases. These CPUs have lives on in arcade machines, gaming consoles, and scientific calculators, as well as credit card terminals, sequencers, and synthesizers.